Offers the “Tennis Club" look and durability of institutional posts. 11 gauge steel posts include solid stainless steel internal worm gear with self locking mechanism that prevents recoiling during winding and removable handle. 3" round green posts. Nets available separately. Ground sleeves available separately for semi-permanent installation. 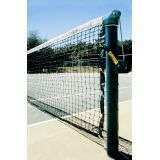 Offers the “Tennis Club" look and durability of institutional posts. 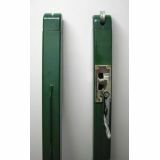 11 gauge steel posts include solid stainless steel internal worm gear with self locking mechanism that prevents recoiling during winding and removable handle. 3" square green posts. Nets available separately. Ground sleeves available separately for semi-permanent installation. 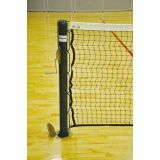 Indoor tennis posts with the durability of our institutional series posts. 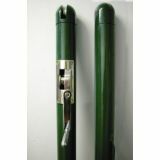 3" round, 11 gauge steel posts with powder coated green or black finish for excellent durability. Solid stainless steel internal worm gear winch with self locking gear mechanism to prevent re-coil during winding. Removable winch handle for safety. includes 36' long net. Use in existing 10" deep floor sleeves spaced at standard volleyball distance (36'). 3-1/2" O.D. 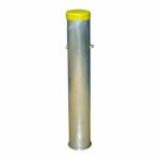 powder coated steel posts include steel top pulley caps with 1-3/4" diameter aluminum pulley. 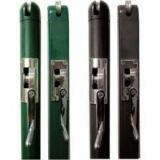 Tensioning ratchet has spring-loaded safety latch and removable handle. Nets and ground sleeves for semi-permanent installation available separately. Fits 3-1/2" O.D. posts. Steel powder coated green. 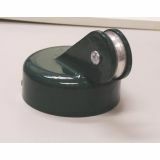 1-3/4" pulley sheave and set screws.